Back from my internet problems- well, sorta. Seems I've gotten the internet situated on our phones, tablets, and the upstairs computer, but my laptop still ain't having it. I'm still working on it, so in the meantime I'm having to do this on our upstairs computer. Not my favorite, but it's either this or not blog. I actually used to use this desktop to blog here and there in the past, but most of my graphics and things are on my laptop. And you're just always more comfortable with what you are used to, right? 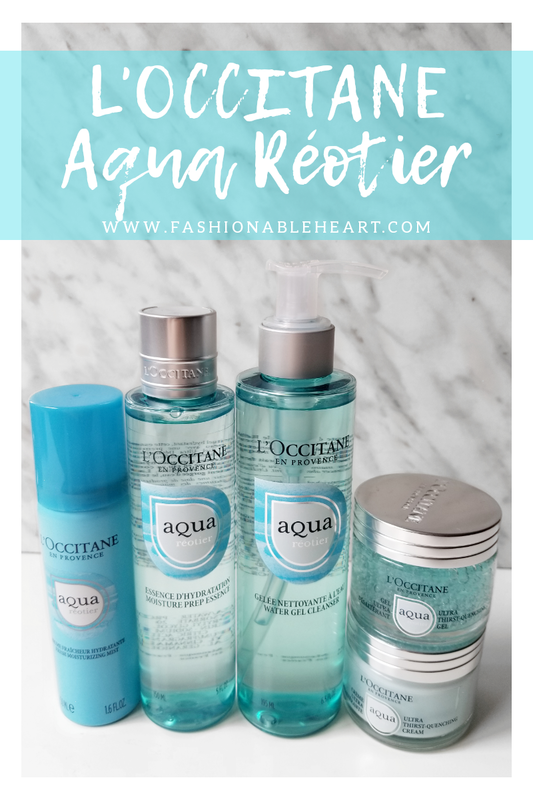 Today, I'm reviewing the L'OCCITANE Aqua Réotier line up of products. That consists of: Ultra Thirst-Quenching Gel, Ultra Thirst-Quenching Cream, Water Gel Cleanser, Moisture Prep Essence, and Fresh Moisturizing Mist. As a refresher, I have dry and sensitive skin. 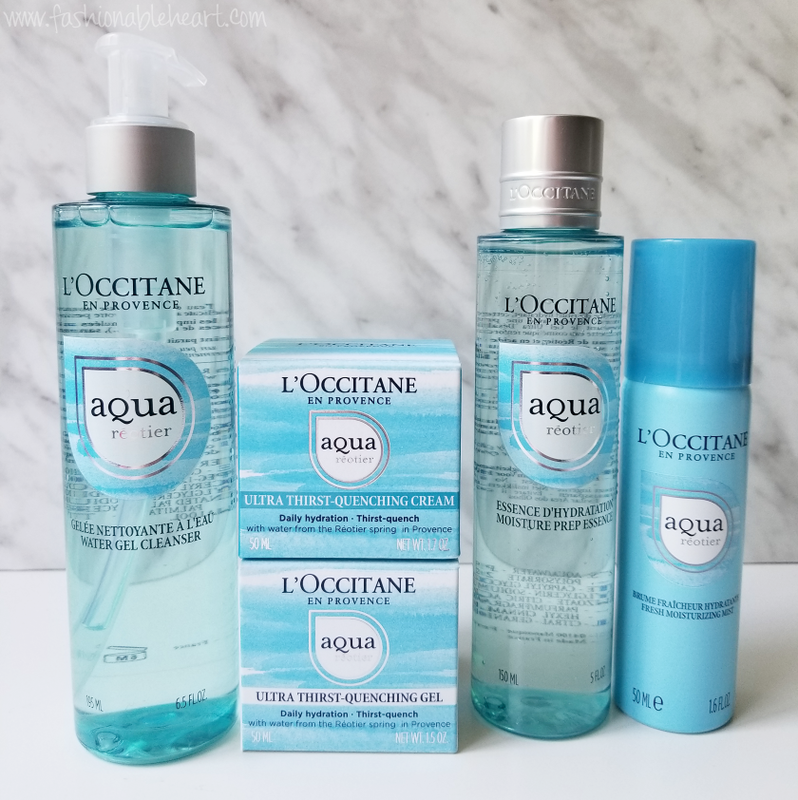 If you're wanting to know what I think of each of these products, just keep reading! Every product incorporates water from the Réotier Spring. Having a high calcium content, these products help your skin to retain moisture. 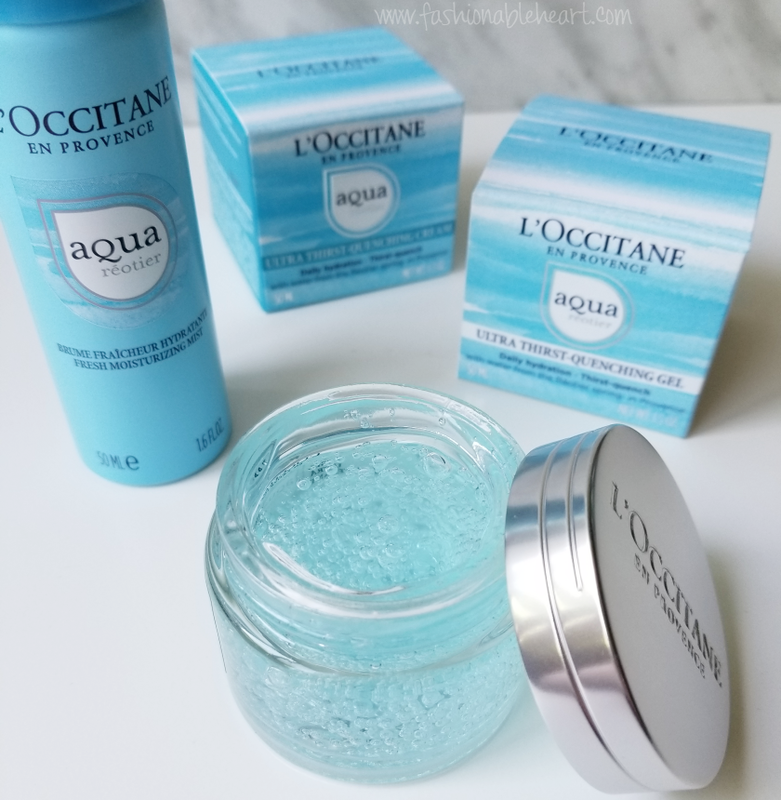 There are three main ingredients in this line: the Réotier water, hyaluronic acid, and glycerin. It's formulated for all skin types. I think this could work for a lot of people! They are scented, but it's a fresh scent. I don't know how else to put it. It's not perfumey and I'm someone who can be sensitive to scents and haven't had any problems with these. 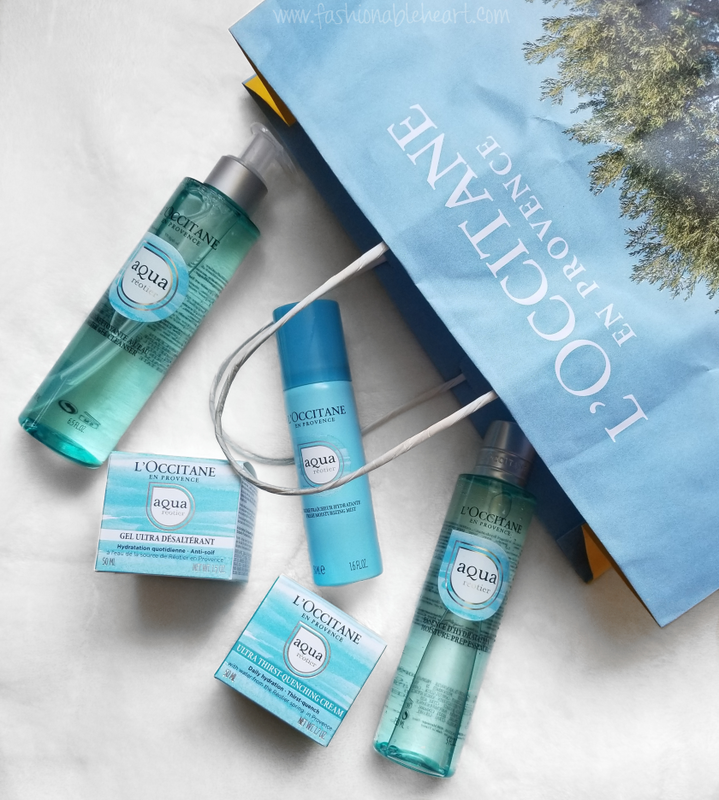 These are all available in L'OCCITANE store locations and online. Maybe you're like me where you think gel and you don't think foaming. But this foams! Being water-based, this is really light. It feels so nice on the skin and cleanses nicely. My skin doesn't feel tight afterward. It takes off makeup pretty well. I don't know that this will be enough for me during the winter months, but it's worked great during the warmer months. So if your skin isn't dry, I can see this working all year. The whole essence thing is new to me and my routine. It's something I've heard of but never delved into. This goes on before the Cream or Gel to prep the skin. It's okay, but I don't know that I would consider it essential. It works similarly to a toner, which I don't always include in my routine either. I mean it's fine, but it's an added step that I don't necessarily see a difference with or without it. But I'm also more on a true serum kick and have better results with them. I love their little mists. They have a spray nozzle and deliver a fine mist that is perfect and doesn't soak you. I like to use it for a dose of flash moisture after my makeup application and during the day. It's small enough to throw in your purse and gym bag. They say this can set makeup, but I usually prefer long-lasting formulas so I can't really comment in that regard. Not my favorite. It's okay, but it takes a while to sink into my skin. I prefer it on days that I am not wearing makeup. As a matter of fact, I really prefer using this one at night and let it sink in while I sleep. It does provide moisture and my skin does feel plump. I just don't necessarily like it under makeup and waiting on it to sink into the skin. Now this one? It's my favorite. Plus, it's so fun to use. Look below and see all of those bubbles! Unlike the cream version, this one takes seconds to sink into my skin. It has a cooling effect and it's just so darn nice for summer use. It doesn't feel heavy at all. Makeup goes on over it easily. It's not a heavy duty moisturizer, but it works well with the other products to provide enough moisture during the day for my dry skin. Again, I'm not sure this would give me enough oomph to get through the harsh winter months when my skin is at its driest. I just can't get away with using the same products year-round in most cases. But this is a major winner during warm weather, for sure! **These products were provided to me for testing and reviewing purposes. All thoughts and pictures are my own. There are no affiliate links in this post.